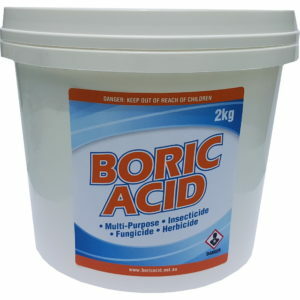 We hear all the time from our customers about how much they love boric acid. From treating insect infestations to disinfecting floors and from treating fungal infections to deodorising their dishwasher, it’s such a helpful product. But there is one common theme in the questions we receive and that is around safety. 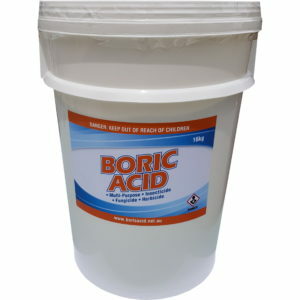 How do we handle boric acid safely? 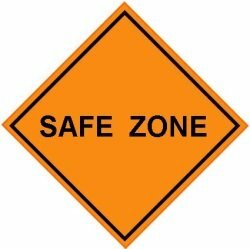 The word safe is relative. Nothing is entirely safe in it’s own right. Life jackets come with warnings, money safes can be cracked, you still get sunburn through sunscreen, drinking too much water can kill you, you get the idea. It’s all about being safe with a product. Most chemicals have a specific set of rules or guidelines for you to follow to give you the best chance to be safe with whatever it is. The truth is, all chemicals have the potential to be dangerous. Even chemicals that are natural, organic or low in toxicity can be dangerous if you come in contact with enough of it. Understanding the risks of a chemical helps you decide how to use it or whether to even use it or not. Two factors go into measuring the risk of chemicals, they are toxicity and exposure. The toxicity of a chemical is how hazardous it is. The more hazardous the chemical, the more toxic is it. “Signal Words” are used to indicate the level of toxicity of a chemical. They are: Caution, Warning and Dangerous. Caution: The chemical is slightly toxic if consumed, inhaled or absorbed through the skin. It could cause slight eye or skin irritation. Warning: The chemical is moderately toxic if consumed, inhaled or absorbed through the skin. It could cause moderate eye or skin irritation. Dangerous: The chemical is highly toxic via any form of exposure. It can cause irreversible damage to your skin and eyes. It may also be highly toxic if consumed, inhaled or absorbed through the skin. If this is the case, the product will be labelled as poison. 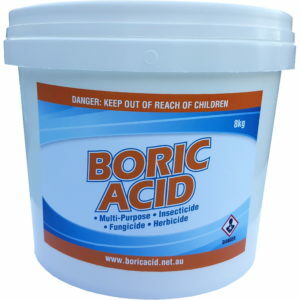 Boric acid has a Caution signal word. Exposure to a chemical takes place when it is inhaled, touches your skin, gets in your eyes, or is consumed. Each is considered separately as some chemicals are more toxic depending on the contact made with the body. Some chemicals, like solvents, can have their toxicity reduced by mixing it with another chemical. 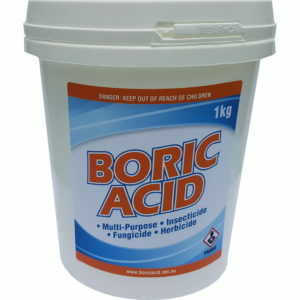 But with boric acid already having a low toxicity level, your best bet to be safe is to reduce your exposure to it. Quite simply put, don’t eat it. 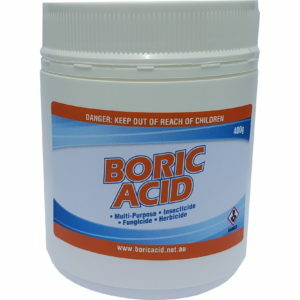 The powder form of boric acid can be very fine. It only takes the merest breath of wind for it to puff up and into a barley visible cloud. For this reason we recommend “P2” respirators/masks. They protect against dust, mist and fumes and are available from all hardware stores for about $10 for a pack of 3. They’re also known as FFP2. Puffs of boric acid dust can also get in your eyes, so it’s best to wear protective goggles. If it does puff up it does settle fairly quickly so look for goggles which have the anti fog ventilation on the side. I use basic PVC goggles which not only do the job, but fit over prescription glasses. 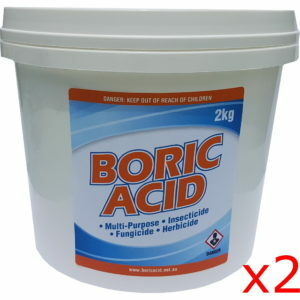 Working with boric acid is a bit like working with flour. After a period of time you’ll find some on your hands and arms. To ensure it doesn’t get in touch with your skin, it’s best to wear gloves and a long sleeve shirt. I also like to wear a hat. This helps stop any airborne boric acid particles getting in my hair. I hope you find this safety guide helpful. If you have any of your own tips to add, I’d love to hear about them in the comments below.